The Burgman 650 looks about the size of a hefty Harley. It has heaps of storage space and the kind of comfort Virgin First Class travellers tend to demand. This biggest-bore scooter yet even features a push button semi-automatic gearbox. The gearbox has two buttons on the handlebars that change up and down although the scooter still retains the constantly variable belt-driven CVT transmission common to all twist and go scooters. This in effect gives the bike two gearboxes – the shiftless CVT and a five-speed manual-style box operated electronically by the thumb buttons. The gearbox also has two separate CVT modes with both sport and economy settings to get the best from the 638cc twin-cylinder motor. One advantage of changing gears manually is that the engine can be used as a brake on steep hills rather than coasting down. The fuel-injected motor is not just a bored out 400cc Burgman – it’s completely new with stricter emission laws taken care of by an exhaust catalyst that cleans the gases. Commuting is made easier by storage big enough for two full-face lids under the seat, a tall and wide screen, a powerpoint and smaller storage compartments on the dashboard. Security is aided by a magnetic ignition cover that only opens for the correctly coded key and prevents anyone else ramming a screwdriver into the lock to break it. 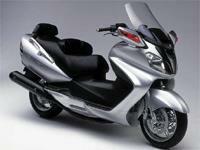 Power is estimated to be around 50bhp with a top speed of around 100mph in line with the Tmax and the X9. Suzuki is so convinced the Burgman name is going to be a continued success it is promoting it as a separate brand – much like Toyota does with Lexus in the car world.